God spoke to me at the Two Rivers Church men's retreat. After registering and putting on my name tag, I looked around and realized I knew nobody. I wondered what kind of time I would have, who I would meet and what God might want to do in my life. "God, do you know I am here in the mountains of GA? Do you know that I do not hardly know anybody here? I am here to know You better. I want to be more consistent in my walk with You. Help me remember that You love me no matter what. Help me know your love both on the cross and right here in GA. Are you able to encourage me in this love? Are you able to motivate me based how how I am wired?" We have a God that speaks. John 10 tells us that God speaks to us and that His followers listen. He says that we are able to RECOGNIZE His voice. Are you able to recognize His voice? How does He speak, any way? He is more willing to speak than we are to listen. Our busy, self-directed lives do not have a lot of room for listening built in. 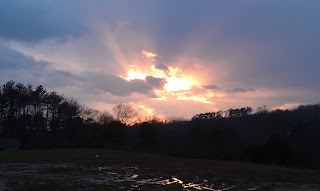 Listen to creation - slow down and enjoy the sun rising, thank God for birds in flight, recognize His hand in the storm. At Alpha this week I caught a glimpse of God. See below for His picture. Listen to the Bible - reading the Bible is good, listening to the Bible is better! Do you read the Bible with an expectation to hear from God? Listen to the Holy Spirit - sometimes it is a still small voice inside, sometimes your "conscience" but God speaks through the Spirit. He whispers Scripture, He encourages, He convicts of sin, He invites you to look to Jesus, He calls us to worship. Listen to your dreams - not all dreams are from God, it might be some undigested pizza that's talking. We want to ask God if he is speaking when we have a vivid dream or vision. Ask the Lord if he is speaking. Listen to others - God will use others in our lives. 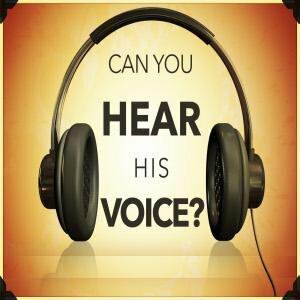 We need to test and weigh what we hear with Scripture and the Spirit of God but we need to listen for God's voice in others. Commit yourself to listening. Tell God that you are willing to hear Him. Ask Him to speak to you. "Lord speak to me as I read your Word. Lord help me hear you today." At the men's retreat God spoke out loud to me. I know that sounds weird but judge for yourself. During the Saturday free time I went to a "Listening Prayer" session. I've never done one of these before. I sat in a room with three other men listening to God. We sat in silence asking God for a "word" for me. If that sounds a bit strange, it felt strange. "I am getting the word "love". The Lord is telling me that He wants you to know how much He loves you. I also get the sense that He wants to let you know that he can motivate you the way you are wired." God also spoke to me about my past ministry experience and His desire to heal some of that pain. They said other things I am sure but I was no longer hearing their voices ... the Shepherd of my soul was talking to me. Apparently He knows my name ... I am listening! God is speaking. 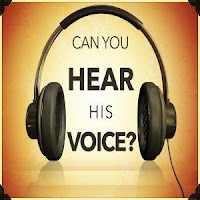 I pray you will hear Him today! Have you ever had God speak to you? How did you know it was Him and not something else? What came as a result of this ... increased faith? a fixed relationship? a financial solution? Great Devo! Yes, heard from God a lot on this journey! Sometimes I have "selective listening" and only hear what I want to hear, or think God is telling me something but it's not clear. LOVE when he speaks clearly and LOVE the joy that comes from knowing I'm in His will :) Great to hear from you! We miss you guys!! !